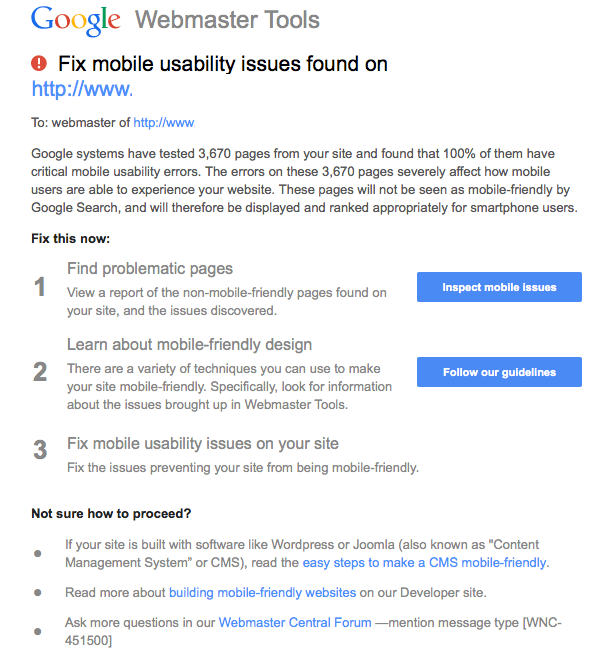 Google has issued the following notification via webmaster tools and email to owners of sites that are not ‘Mobile-Friendly’. Based on this notification it’s clear that Google intends to favour ‘Mobile Friendly’ sites in search. The question now is, when will we see an algorithm change to reflect this favouritism? Google have told searchengineland.com that they have been experimenting with new mobile friendly search algorithms since November so my guess is that non mobile friendly sites will begin to feel the pressure by mid to late this year. My opinion is… It’s about time. My advice is, don’t wait till you see your rankings get hit and start planning development now.